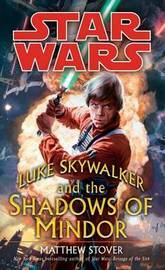 66.67% of people buy Luke Skywalker and the Shadows of the Mindor and Star Wars Clone Wars: Wild Space ~ Paperback / softback ~ Karen Miller. Matthew Stover is the New York Times bestselling author of the Star Wars novels Revenge of the Sith, Shatterpoint, and The New Jedi Order: Traitor, as well as Caine Black Knife, The Blade of Tyshalle, and Heroes Die. He is an expert in several martial arts. Stover lives outside Chicago. From the Hardcover edition.